HighTechXL was, to some extent, already established in China. But you went to Shanghai without speaking Shanghainese Mandarin and with no China experience. So, this all must have been like building a startup from the ground up. How did you make this all work? Luuk Eliëns: Well, it has indeed been quite a ride! We really went through the typical startup roller coaster to try and build the China business. One thing to understand about China: building relationships and, consequently, building business, takes time. I personally underestimated how long it takes to actually get business going. On top of that, in the very beginning of our arrival in China, we were completed sucked into the execution of a very big project, so we did not really have time to properly develop the business. After about four months, things started to change. We started to free up time for business development, the HighTechXL brand name became more well-known and established in China, and we started receiving a lot of customer requests. And once the ball started rolling in China, there is no stopping it. So since then, we signed up several clients such as Intel, Pernod Ricard, Immochan and BMW. To get back to your question, ultimately, we made it work because of a combination of sheer hard work, grit and persistence, a great and thriving partnership with our partner Xnode and by being dedicated to delivering a great quality acceleration program to our clients. So, they started becoming our sales force. People generally describe you as "bold." Does it help to be an extrovert when starting up in a new country and culture? Or did you have to dial it back a bit? LE: I definitely think it helps to be a bit bold. I am indeed not shy and quite comfortable standing my ground in various circumstances. This has its upside: as a relatively young guy, it’s important to quickly gain respect, especially in China, so in that sense it definitely helped. On the other hand, being a Dutchman, I have the tendency to be very direct and to the point. This very often does not work in China. Over the last 10 months, I learned the importance of being patient and developing the relationship (including lots of small talk) before it’s possible to do business. Tell me a little about the business dynamic in China. Your suppliers, clients and partners are your friends, correct? How much time do you devote to business entertaining, for example? Did your private life and professional life segue into one another? LE: I have never in my entire life met a people – or lived in a country – where people are so dedicated to their work. In China, people have about 10 holiday days per year and when those holiday weeks arise, almost everyone works on either Saturday or Sunday to ‘compensate’ for the time off. I have meetings very regularly on Sunday or Saturday and had to get used to that, especially in the beginning. At the moment, my personal and professional life are completely intertwined, and I often joke that my weeks consist of three parts: a big deep breath on Monday morning; one big working day from Monday until Friday, and then a beer on Friday night to look back on the week. It’s obviously not sustainable to be working and living like that in the long term. For now, however, I am enjoying every second of it. It’s great to see so much growth and opportunities and to be managing growth. Did you experience culture shock? And how did you cope/compensate? LE: Before living in China, I travelled Australia and New Zealand for a year. I lived in Portugal for two years and in Spain for half a year. So, coming into China, I did have some experience living abroad. However, China is a different ball game altogether. The work culture and the role of the government and hierarchical structure within an organization are so fundamentally different that, yes, I did experience culture shock. The best way to cope with that, for me, is humor. Trying to put things in perspective, taking a step back to see the fun of it all helped me greatly in overcoming the initial culture shock. You worked with both international companies with Chinese operations and pure-play Chinese companies, correct? Did you have to modify the internal acceleration process to suit the Chinese business culture? LE: Absolutely. I have two core lessons here. 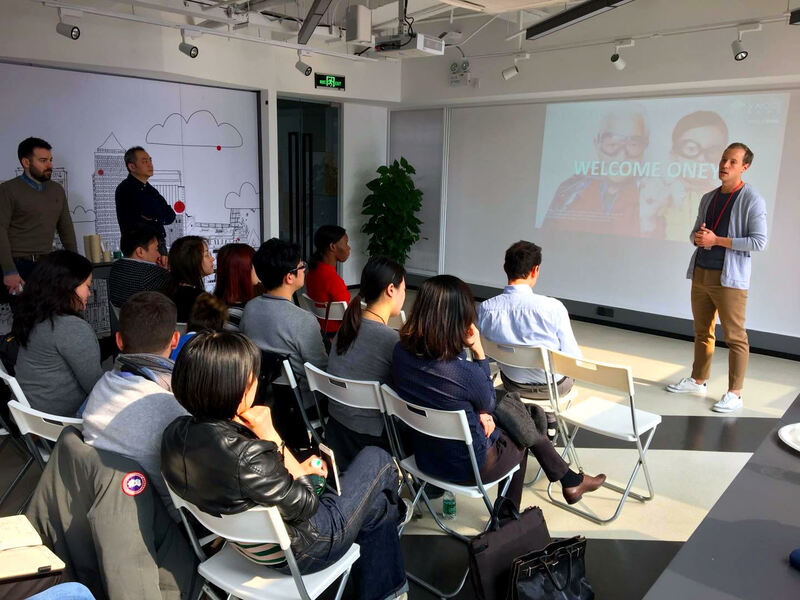 Number 1: In China, if you want individuals to act like entrepreneurs/intrapreneurs, it doesn’t work to explain to them a concept and then just let them run with it. Instead, you really need to take people by the hand and do it with them. You need to literally show the way in little baby steps in order for them to understand the process, principles and added value. On the other hand, once they get it, they really get it. So, in my experience, making innovation happen in China is much more like an exponential function rather than a linear one. It starts slowly, but once it takes off, there is no limit to the speed and progress that can be achieved. Number 2: In order for people to accept your lessons, methodology and authority, the most important thing is to build the relationship with every individual. This means spending a lot of time together. To build and earn trust is not easily achieved. However, once it’s there, the amount of commitment and dedication people display are incredible and mind-boggling. What are your tips for relationship-building vis-a-vis the Chinese business culture? LE: In China, relationships are everything. Personal relationships and business relationships are virtually two sides of the same coin. One very practical example: In China, everyone makes use of WeChat. WeChat essentially is a combination of WhatsApp and Facebook (private relationships) and LinkedIn (business relationships). Both your social and business life are organized in and on WeChat. In fact, many Chinese people take care to post on their WeChat Moments (their timeline) a combination of business and private matters. By striking this balance, they show to their contacts they can be trusted since they are more than just a businessperson. They are an individual, perhaps with a wife and a child. In China, seniority plays a role in business relationships, correct? You’re young … how did you deal? Seniority is indeed a key factor in building business relationships in China. I struggled with this quite a bit in the beginning. People naturally assumed others in the room would be in charge and wouldn’t always take me seriously. I have found the best way to deal with that is to 1) be endorsed as much as possible by the seniors in the room and 2) to just relax about it and, first and foremost, display confidence and skill whenever I can. Since things are going quite well now and we are growing rapidly, it is becoming less and less of a concern. Luuk Eliens is a profound believer that the only real way to tackle the global challenges our world faces is through innovation. He has started three companies and has sold one. After that, he worked as an Innovation Manager at EY, setting up Innovate EY, an internal innovation program. Now, Luuk is responsible for leading the HighTechXL China team in establishing operations in Shanghai. There we help corporates and startups accelerate their innovation from idea to prototype to scale-up by means of a top-notch accelerator program supported by a community of mentors, corporates and entrepreneurs.